Brighten their day with beautiful edible flowers! Our rich butter cookies are freshly baked and hand decorated as lovely flowers. 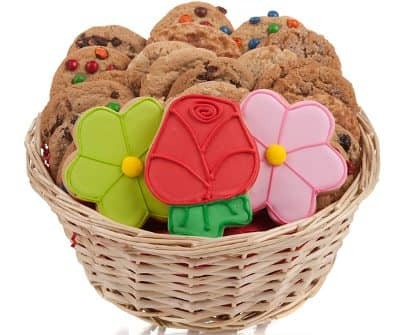 A Lovely Flowers Cookie Gift Basket is a great way to send a surprise for any special occasion or holiday! Your Lovely Flowers cookie gift arrives in a gift basket complete with a decorative bow.